Designs cover single or dual installations for most vehicles. 100% Aluminized components for superior corrosion protection. Heavy duty necks for easy sizing. Large inner tubes allow straight-through power. Large body 4-1/16" x 10-1/2" and 4-1/2" x 11" ovals for light trucks, cars, and vans. Slimmer 4-1/4" x 8-3/4" ovals to fit today's performance vehicles. Smaller 3-1/4" x 7-3/4" ovals are also available for areas with tight space constraints. 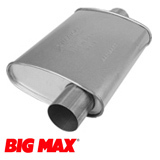 A perfect match with Max Fit pipes for an affordable performance upgrade. Excellent performance sound and reduced engine backpressure. Perfect for custom and dual installations.